For the sake of America, please, please Phil do not surrender. We have seen this scenario played out on countless occasions; the left launching a shock-and-awe gang media assault on someone who dared to publicly challenge political correctness. The target of their wrath is bludgeoned into submission; overwhelmed with daily hit pieces filled with exaggerations, distortions and even lies about the target's original comment and intent. I am black. In his GQ mag interview, I felt no “evil or racist” intent in Phil Robertson's comments about the blacks he knew in his youth. And yet, Phil's intention is irrelevant to the left. Like sharks smelling blood in the water, they pounced on an opportunity to “trap” Phil; branding him a racist and a hater of homosexuals for simply quoting the Bible. The left reminds me of the pious, arrogant and elitist Pharisees in the Bible. They hated Jesus for doing good works, miracles and connecting with the people. So, they launched a campaign of word games designed to “trap” Jesus into saying something that would help them to brand Jesus a lawbreaker and blasphemer. The left employs very similar tactics. These people on the left are despicable. They are not about fairness or truth. They are about furthering their liberal socialist progressive agenda by any means necessary. So if dividing the country along racial lines helps their cause, so be it. They say the best predictor of future behavior is past behavior. Thus, it does not take a genius to know how the left's war on Phil Robertson, which is really a war on traditional America, will play out. Phase one is their tsunami of published hit pieces and media pundits branding Phil Robertson a sexist, racist and homophobic. Phase two is to have the whole bowl of left-wing alphabet soup (NAACP, GLAD and NOW) attack Phil from all sides. 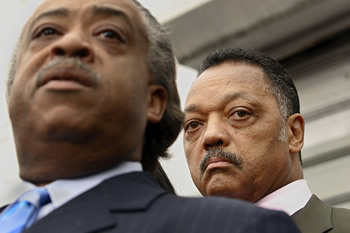 Phase three is Sharpton or Jackson demanding that they “get paid” and the offender kiss their ring. In the case of the Duck Dynasty controversy, master exploiter and extortionist Jesse Jackson has taken the lead, demanding that A&E and Cracker Barrel meet with him. Whether or not A&E and Cracker Barrel bows down to worship Jackson remains to be seen. My plea to Phil Robertson is that he please, please, please do not surrender. Do not on bended knee kiss Jackson’s ring and beg for forgiveness. It would be a mortal blow to the tremendous example he had set inspiring Americans to push back against the tyranny of political correctness. In every incident of a slip of the tongue or misinterpreted comment by a conservative or a Republican, the left's political correctness police bludgeons them within inches of their political life. The targeted person humbly surrenders and begs for forgiveness; all of which empowers the left, furthers their agenda and adds another notch on their gun. To my knowledge, Phil Robertson is the first to push back against political correctness with the support of a vast majority of the American people. Thus, to Brother Phil I offer a few pearls of wisdom. In case of a near death experience, do not go to the light. As told to Luke Sky-walker, “Stay away from the dark side”; and when unjustly accused of being a racist, do not kiss Sharpton or Jesse (where's the camera) Jackson's ring. Phil, surrender would break our hearts. Good folks across America are praying for you. They say the best predictor of future behavior is past behavior.